You’ve heard of Blacktron, those scoundrels who scoured the LEGO universe mercilessly in the 80s and early 90s. But the universe is nothing if not balanced, and so a few fans have banded together to bring us Whitetron. I can’t tell if they’re any more peaceful than their darkly clad counterparts, but they sure would be a lot easier to see against a starry backdrop. 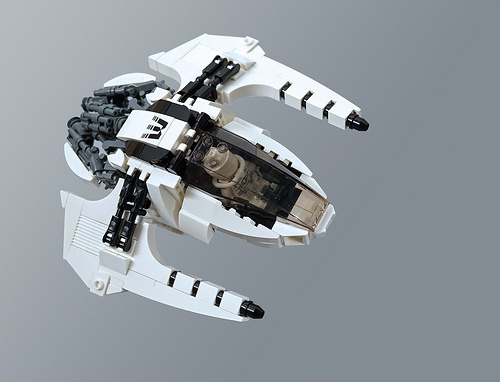 This little fighter craft by Tim Goddard has a great mix of clean lines and aggressive detailing, with lots of minifigure blasters and binoculars used to greeble out the engine compartment. 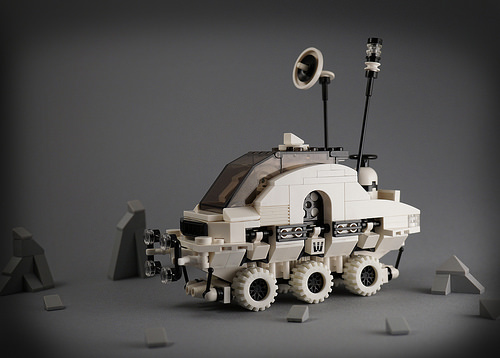 And while this awesome rover by Frost was built back in February, we couldn’t highlight the theme and let it go by without mention. I’m particularly struck by the style that the black five-spoked wheel covers give when paired with the white space wheels. 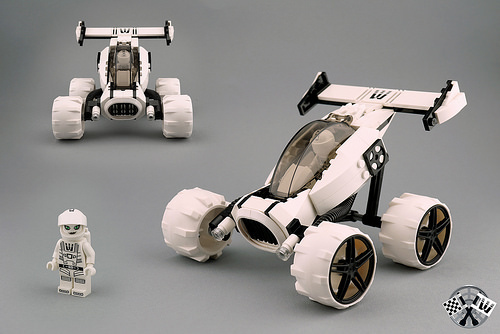 Frost also built this great little exploration buggy, which has a wonderful cartoonish feel. I’m not entirely sold on its styling in comparison to the sleek, futuristic aesthetic of the other vehicles, but it’s delightful in its own way, and an excellent place to use those white rubber wheels from Spongebob’s vehicle. Is that torso custom? I think that white visor used to be fairly rare, although now it’s possible to rub off the printing on the Calculator’s visor. Love the black and white design.